The only thing more exciting than flying your own personal drone is flying the one you built yourself. 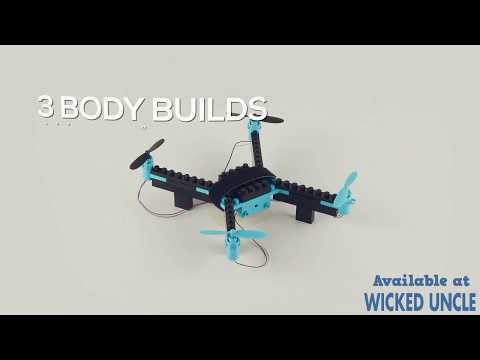 Using this comprehensive kit, you'll be able to build 3 different drone configurations, with 3 speed settings, directional LED lights, and a protective rail guard. You can build, deconstruct, and build again for the various missions you'll be carrying out with your drone. The 40 main body pieces allow for rapid customization, and the 85 bonus pieces can be arranged into a car or a plane to attach to your fully operational drone. The RC unit requires 3 AA batteries but the quad drone comes with removable, rechargeable battery. The long-range RC transmitter controls the drone, so you can set it to buzzing and whirring around your room, your backyard, or wherever else your mission takes you! Size: 14" x 9.5" x 3"